Hey there muzic.net.nz readers! I hope you are all having an amazing start to 2006. Unfortunately the content of this newsletter differs from the one previously advertised, we hope this does not cause any inconvience for you. As you have probably read recently, SoundSplash took place on Waitangi weekend at the Wainui Reserve. Some said that this was probably the best concert 2006 had to offer. They were not wrong, with Salmonella Dub, Katchafire, Rhombus, Anika Moa & The Plastic Tiki Band just to name a few, SoundSplash hosted some of the most amazing names in New Zealand music that you are ever likely to see live. In this issue, we have features with Renee Maurice who is only 14 years old and has already released her first album, and Pink Champagne who have suggested having traces back to the Sahara Desert in Libya back in 1977! As far as huge international acts go, it doesnt get much bigger than U2! Best of luck to those of you who managed to snaffle tickets for the U2 concert upcoming on St Paddy's Day. This is my personal pick for upcoming gigs of 2006, although I’m not personally going because I couldn't get through on the phone lines, and wasn’t prepared to pay several hundred dollars per ticket on TradeMe. I think that there won't be a bigger concert in NZ than U2 unless the likes of Metallica decide to come out here. On a local scale there seems to be a bit of a recession in Hip Hop releases as of late, but this promises to warm up later in the year, along with us having heard that Epitome are already hard at work on a debut album. Also, muzic.net.nz are sad to announce that Mozelee will be performing their last gig on Feb 18th, and Fourth Member have now called it quits after close to 10 years on the music scene. Please take some time to make sure you check out www.mozelee.com, and www.fourthmember.com. These are two amazing New Zealand bands that muzic.net.nz have supported over the years, and are very sorry to see split. Members of Mozelee are rumoured to be starting a new band, in more of a Rock/Hip Hop blend that might appeal to some new audiences. At just 14 years of age, Renee has written 23 songs, many of which are in the process of being recorded at Creative Places in Christchurch. Renee is quite possibly the youngest person we have had the pleasure of interviewing for our newsletter! You've got to let things happen, try for things if you want to succeed but don't let them be your downfall when they don't. Don't let anybody tell you what you will be if that's not what you really desire. Make the right choices as often as you can and when you don't, learn from your mistakes. Be thankful for all fortune that comes your way and don't ever give up on anyone or anything. No one can manipulate you if you stay true to yourself. Don't give up and don't compromise. Remember; If you reach for the stars, you might just become one. 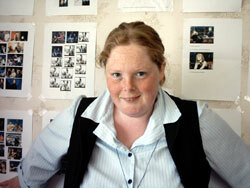 For more information on Renee please view her profile on muzic.net.nz. 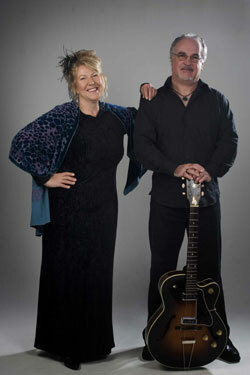 Pink Champagne are Steve and Cheryl O'Connor, a soulful jazz and cruisey blues duo. Keeping to our theme of staying away from general mainstream NZ music this issue, we decided to find out more about these guys! Cheryl: Pitch Black, Marg Layton, Shaken Not Stirred, Salmonella Dub, and Brilleaux. Steve: Lil' Ian Goodsman, Billy TK Snr, Simen "Blue Keys" Taylor, and the Darcy Perry Band. Both: The Bay of Islands Jazz and Blues Festival. What is the best thing about being in Pink Champagne? Both: Entertaining the public with our own style of classic and modern jazz and blues. Both: Performing mostly self-composed originals to a new generation of jazz and blues enthusiasts. Both: Through live performances and our website. Both: That we have performed with Keb' Mo as the supporting act! Steve: It can be a cruel environment and lots of famous musicians have been close to despair before making a breakthrough. So just keep positive and keep going. Cheryl: Believe in what you're doing despite any criticisms. Check out the Pink Champagne page on muzic.net.nz for more information, including a link to their website which has samples of their music and more! WIN THE RABBLE, FRONTLINE AND GOODNIGHT NURSE! Check out our competitions page, where we're giving away copies of CDs from all of these groups/bands and much more! 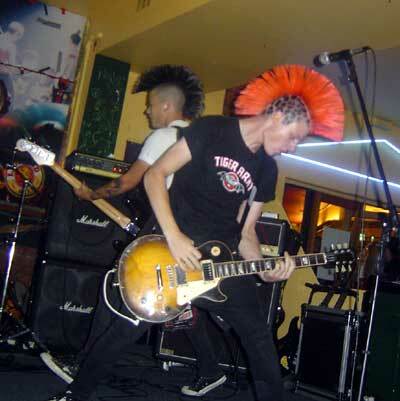 Chazz (front) and Roi from The Rabble live at Guv'nors in Palmerston North. Their debut album 'No Clue, No Future' is out now!